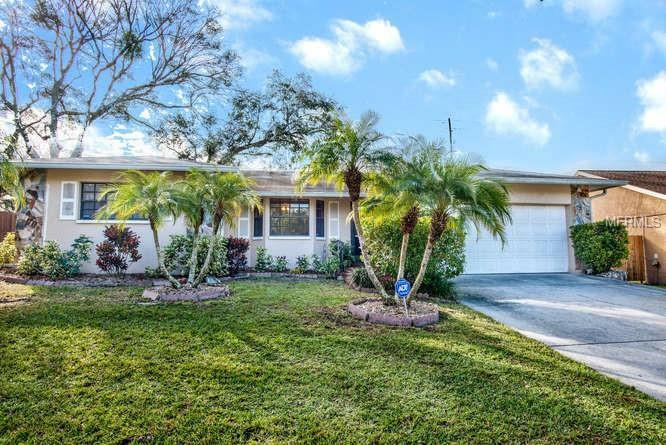 Come see this move in ready family home in the popular Palm Harbor neighborhood of Spanish Oaks! This 4BR/3BA pool home has been almost completely updated and no flood insurance is required. Freshly painted interior and newer laminate flooring throughout, the front door entry leads to a comfortable living room, master bedroom, and the first guest bedroom. Master bath has updated double vanities and renovated shower with plenty of closet space. Open concept kitchen has newly resurfaced cabinets, granite counter tops, and stainless appliances with a view of the dining room, backyard, and pool area. The second guest bedroom and a small office nook are located off the kitchen. From the the dining room, walk through a spacious family room with newer carpet that leads to the fourth guest bedroom. An interior laundry and third bathroom are by the entry to the garage. A sliding door leads to the screened in pool with a paver patio and pebble tech finish, all installed in 2013. A beautifully landscaped backyard completes this Florida oasis. Tons of updates that include: hurricane impact windows and slider in majority of house in 2015, new A/C in 2011, new A/C duct work and insulation in 2015, Roof 2011, new gutters and guards in 2014, water heater in 2015, disposal in 2017 to name a few. Home is zoned for Palm Harbor University High School and is minutes away from downtown Dunedin, Palm Harbor, Pinellas Trail, and Honeymoon State Park. Don't let this fantastic house get away! Copyright © 2019 Mid Florida MLS. All rights reserved. The data relating to real estate for sale on this web site comes in part from the Internet Data Exchange Program of Mid Florida MLS. Information provided is for consumer's personal, non-commercial use and may not be used for any purpose other than to identify prospective properties consumers may be interested in purchasing. Realty Executives Suncoast participates in the MFRMLS Internet Data Exchange (IDX) program, allowing display of other MFRMLS broker's listings on this site. However may not include all listings currently available. Information is deemed reliable but not guaranteed. Information last updated at 2019-04-24 07:50:51.